Forget the HAL 9000, Skynet, or Cylons… the next step in human evolution is already here, and it’s a hands-free way to eat fast food. 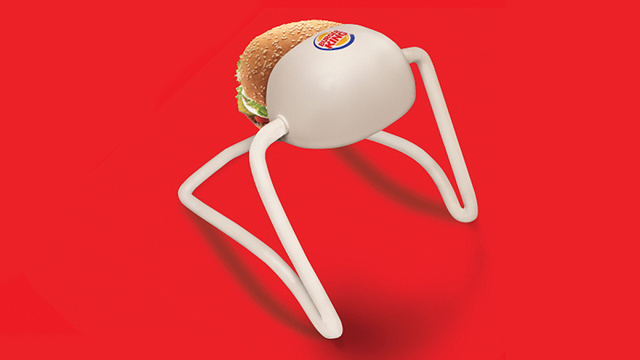 Alas, the “hands-free Whopper” holder seen above isn’t available at your corner store. Instead, it was a promotional item sent to 50 Burger King fans in Puerto Rico to mark the fast food chain’s 50th anniversary on the island. It’s a novel idea, but we wonder what happens after the user eats half of his or her burger. There is still a full half-Whopper or so inside the holder. Sure, you could nudge it around to get some more, but eventually it would seem that you would need your hands to finish. So it’s far from perfect — for now.